The first Bronco features all flat window glass, a mechanically simple Ford engine, an uncomplicated transmission and suspension, and the ability to strip it apart like a Meccano model. It’s a vehicle that lends itself well to customization, and a car that lends itself to creativity both in how you configure it, and in how you use it. 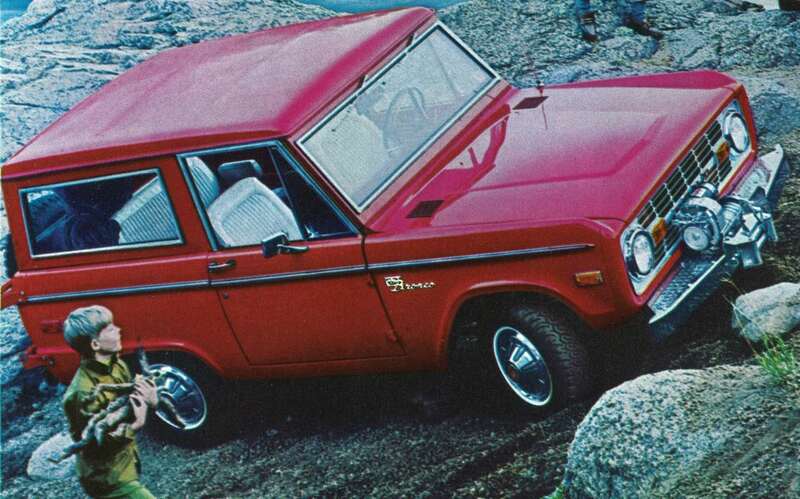 The Ford Bronco was not quite the trailblazer that the International Harvester Scout was. The Scout literally created a new genre of American vehicle that offered genuine off-road ability with many of the creature comforts of a road car, this genre that would later become known as the SUV, but back then was called an MPV (Multi Purpose Vehicle). 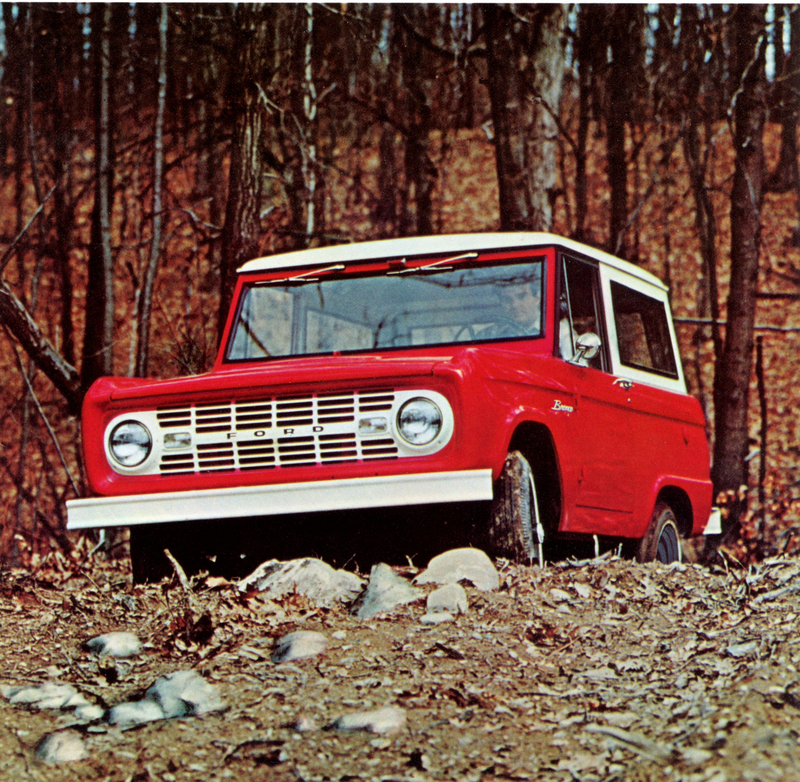 Ford’s Donald N. Frey (one of the men who created the Ford Mustang) took a good look at the progress the little International Harvester Scout was making and decided to create a vehicle that delivered what the Scout delivered but with a little bit more in the way of comfort. Frey could see that the Scout was a car that offered the off-road abilities of the Jeep CJ and the Land Rover, but in a vehicle that was civilized enough to be used as a daily driver. The Scout was a utilitarian road car that could go off-road with great effectiveness. Frey decided to create a vehicle with a few more road car creature features than the Scout, with just as much (or more) capability both on and off-road. The design team charged with creating the Bronco was led by Ford engineer Paul G. Axelrad. The car was a new design from the ground up although it used generic parts as much as possible. The use of generic parts would both keep production costs down and also help ensure that the parts for the new automobile would be available at your local Ford dealer regardless of where you might be. The Bronco used axles and brake assemblies from the Ford F100, and the 170 cu. in. in-line six cylinder engine used in Ford Falcon passenger vehicles and Econoline trucks, but with solid valve lifters and a carburetor with modified floats that would not be sensitive to the vehicle being used at more extreme angles than would be expected for a road car. 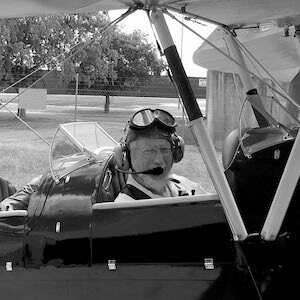 The engine was given an oil bath air cleaner to cope with extremes of dust, and a heavy duty fuel pump to keep the gasoline coming in all conditions. 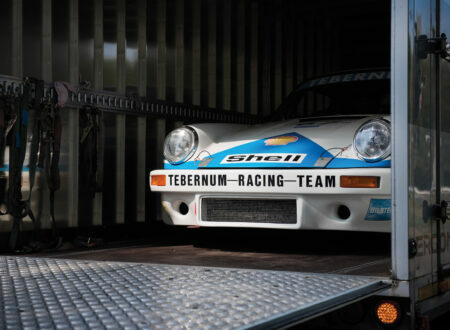 The sump was modified to fit the chassis and suspension, and its capacity increased to six quarts. The gearbox was a generic all synchromesh three speed and the transfer case by Dana Corporation, a Dana Model 20, with a Dana Model 30 front differential with manual locking hubs. (Dana Corporation also made the transfer case for the International Harvester Scout which originally used a Dana Model 18). 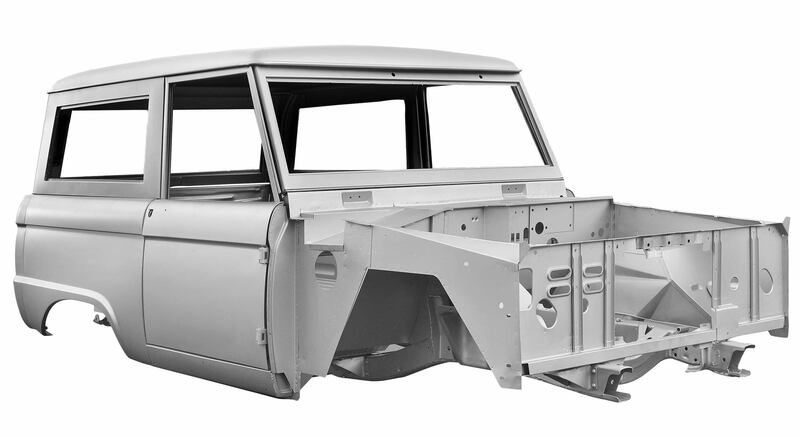 The chassis of the Ford Bronco was purpose designed from the ground up for the new vehicle and was a simple ladder frame type. The rear suspension was the conventional leaf spring and live axle generally referred to as the Hotchkiss type suspension. The front was rather more sophisticated however having the live axle mounted using radius arms that connected to the chassis just rearwards of the gearbox, and complimented by a lateral tracking bar to keep the assembly centered in the frame; the front suspension used coil springs which provided it with significantly more travel than would be possible with leaf springs. This front suspension design also made it possible to give the Bronco a tighter 34′ turning circle than its front leaf spring equipped competitors, and provided the added benefit of being anti-dive. Ford called this front suspension system the “Cushion Beam”. 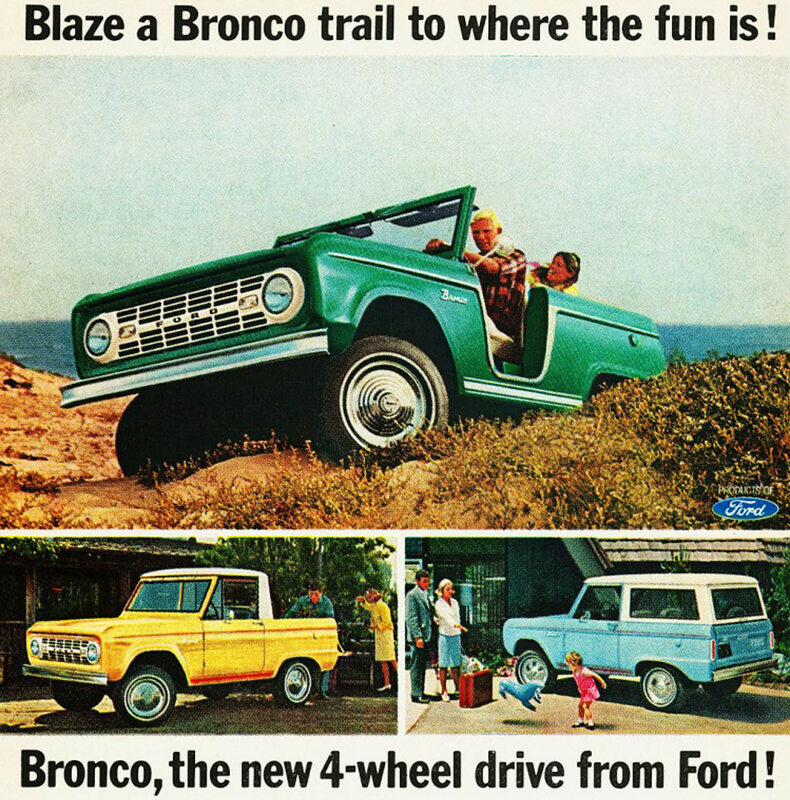 The first cars went into production in 1965 to be sold as 1966 models and the Bronco was offered in three body styles; wagon, pick-up and roadster. The roadster was an open utilitarian vehicle, much like the Jeep, and simply didn’t appeal to buyers who were looking for a blending of road car and off-road car that would enable them to take their comforts off the beaten track. The pick-up fared a little better than the roadster, providing a comfortable cab for two or three people with a modest load carrying capacity on the back, useful on the farm or ranch or for hunters and fishermen. 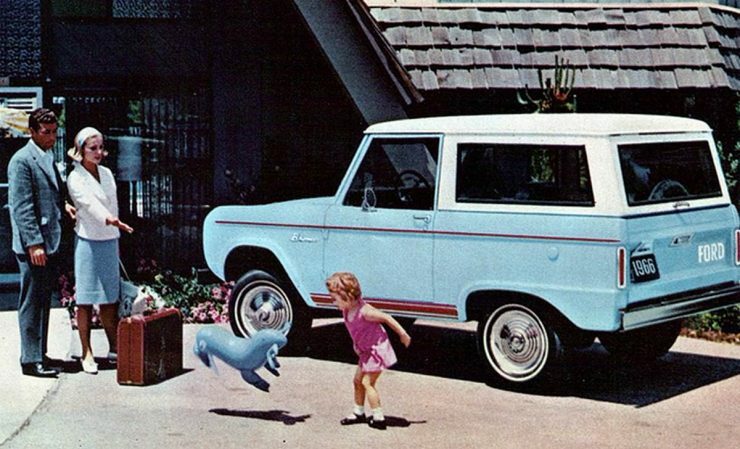 But it was the wagon that outsold them all and would continue to do so for the entire eleven years of first generation Bronco production, affirming that what people were looking for was a comfortable vehicle to take them adventuring and camping, but also perfectly at home in the suburbs doing the shopping and taking the kids to school. It would take Ford a while to really appreciate that market and upgrade the Bronco to cater for it. 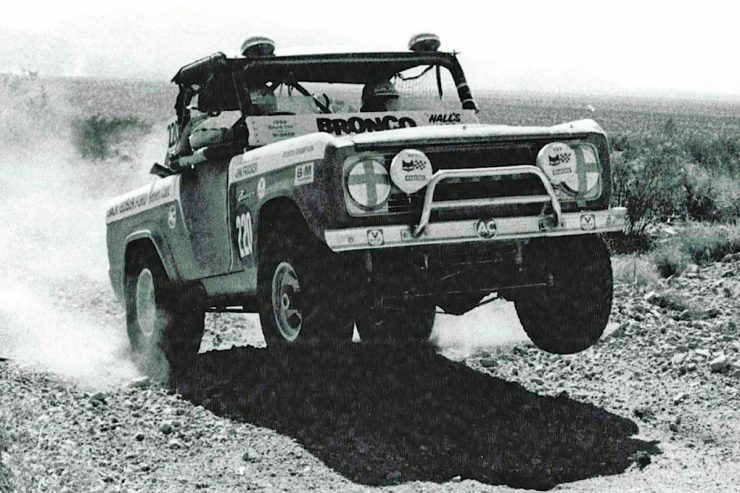 The Bronco was provided with pre-sales publicity by Bill Stroppe who put together a team of the new vehicles to compete in the Mint 400, Baja 500, and the Mexican 1000 (later re-named the Baja 1000). In 1969 the team entered six Ford Broncos in the Baja 1000. 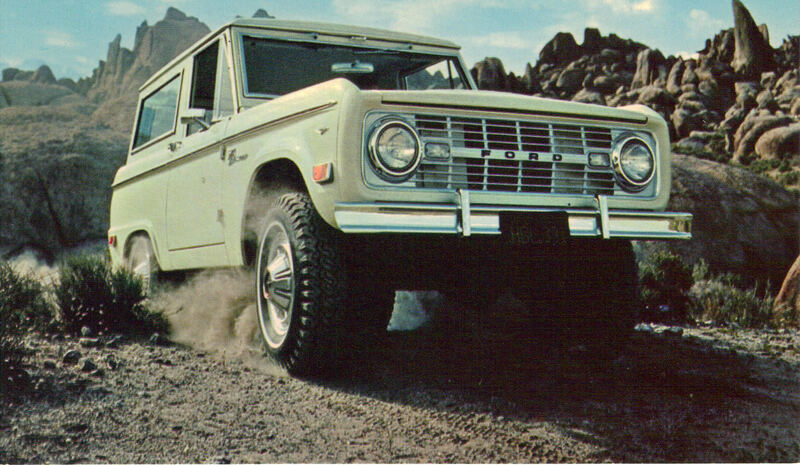 This then led to Ford creating the “Baja Bronco” option package for 1971. This package provided an eye catching red, white, blue and black paint scheme with significant technical improvements such as quick-ratio power steering and a padded steering wheel, automatic transmission, roll bar, Gates Commando tires with stylish fender flares, and reinforced bumpers. 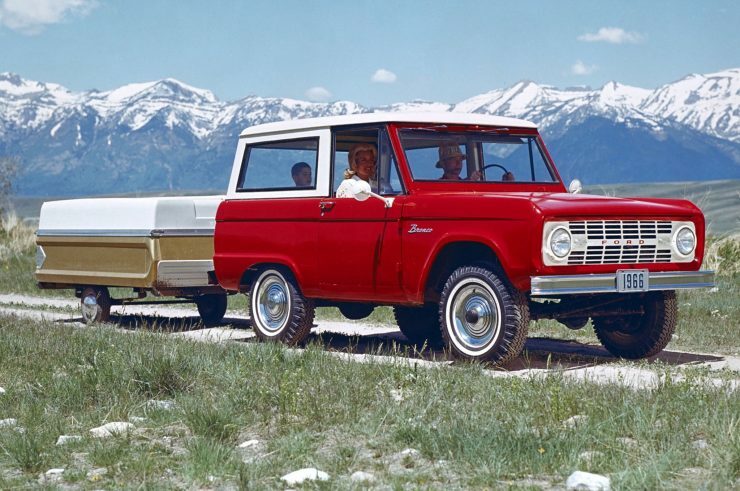 It was an option package that pointed to what the Ford Bronco should perhaps have aspired to become but Ford remained conservative and cautious in their development of the Bronco. 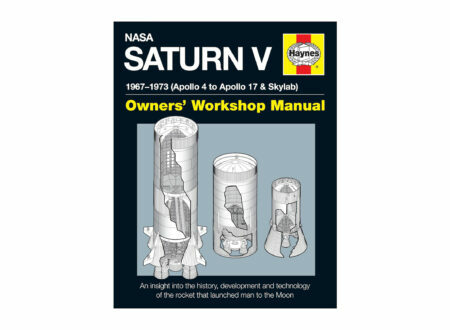 This first model went into production in August 1965 and ended production in August 1966. Produced in wagon, pick-up and roadster body styles the available optional extras were minimal but included a heavy duty suspension option. Brakes were drums all around and neither brakes nor steering were offered with power assistance. Engine was the 170 cu. in. in-line six cylinder producing 105hp and mated to an all synchromesh three speed gearbox with column shift. Fuel tank capacity was 12 US gallons. Options included power take off, winch and snow snowplough provisions. For the 1967 model year Ford had realized that there was a need for a more powerful engine so they offered a 289 cu. in. V8 as an option. An additional five gallon reserve fuel tank was optional. For 1967 Ford also tested the market by offering a “Sport” package with vinyl seats, chrome bumpers and aluminum body trim with “Sport” emblems, cigar lighter, chrome bumpers, and 15” wheel trims. For 1968 the roadster model was discontinued leaving just the wagon and the pick-up in production. The dashboard was now made of steel and re-designed, and the old style vacuum windshield wipers were still standard but far more effective electric ones were offered as an optional extra. A swing out spare tire carrier was also offered as an option. The bumpers gained curved ends and the interior door handles and window winders were re-styled. The big change for 1969 was the upgrading of the V8 engine option to the 302 cu. in. unit. This engine produced 210hp with 300lbs/ft of torque. Ford were still being cautious in what they offered in the Ford Bronco and when the car featured in an edition of Popular Science magazine the tester, Jan O. Norbye, was quick to point out the car’s strengths and weaknesses. He said the Bronco had far better handling than its competitors, the International Harvester Scout, the Toyota Land Cruiser, Jeep CJ, and the British Land Rover. 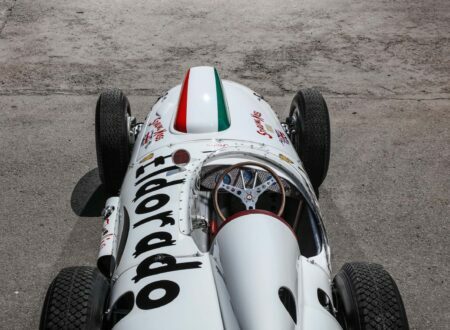 However Norbye noted that the car needed a four speed gearbox and one mounted on the floor not the column. He also said that the electric wipers should be standard not an extra cost option, that the brakes of the Bronco were poor, and the steering “abominably slow”. Not only did the Ford Bronco get criticisms that were valid and that clearly needed to be acted on, but the appearance of the Chevrolet K5 Blazer with power brakes, power steering, option of either automatic or four on the floor transmission, air conditioning and a more powerful V8 engine option, also caused Ford to sit up and take notice, not least because Chevrolet were selling more than five times as many Blazers as Ford was selling Broncos. The Ford Bronco continued largely unchanged for 1970 but Ford worked on incremental improvements which would appear in 1971. One welcome change was the provision of a remote control for the outside left hand door mirror. For 1971 the Dana 30 front differential was upgraded to a Dana 44 and the old three piece wiring loom was replaced with a much better one, which resulted in the fuse box being sensibly re-located into the glove box. 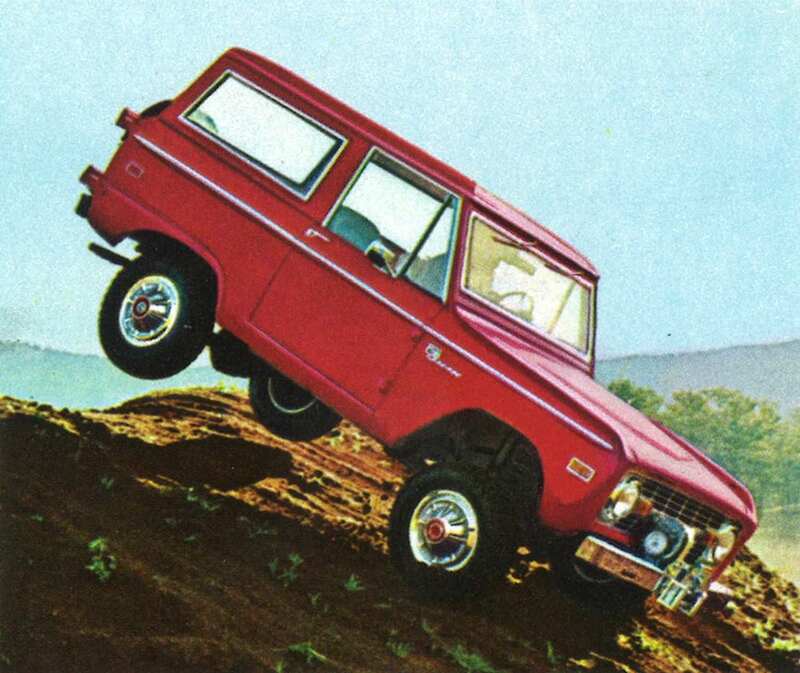 The Stroppe Baja Bronco was introduced. 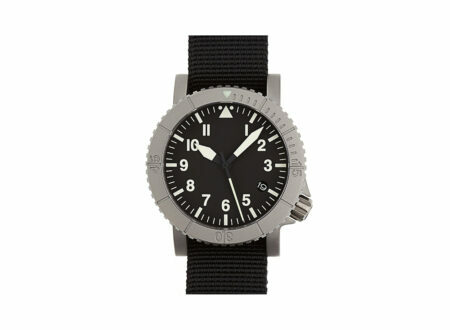 This was much more upmarket and much more expensive and consequently did not sell well with only 650 made. The Stroppe Baja Bronco featured a roll bar and both front and rear dual shock absorbers, Gates Commando tires with body flares to accommodate them, automatic transmission, and quick ratio power steering. For 1971 the 170 cu. in. engine was upgraded to a 200 cu. in. six cylinder engine and both power steering and an automatic transmission were provided as an option. Another improvement was the re-designing of the column shift to make it smoother and more positive. Additional paint colors were also provided. This was the year the pick-up model was discontinued. Moving into 1973 Ford introduced power steering as an option for the 302 cu. in. V8 engine equipped cars as well as a C-4 automatic transmission. The transfer-case shifter became the J-Style in place of the T-shift and the Explorer option package was introduced. The Bronco was finally given an interior light which was incorporated into the electric wiper cover. This gives us a bit of an insight into Ford’s thinking about the Bronco which still had it pegged as quite a utilitarian automobile. By mid 1974 the 302 cu. in. V8 was given an electronic ignition system, and 1974 was also the last year of the 200 cu. in. six cylinder engine. In 1975 emissions regulations came into force for the Bronco which meant it had to work with unleaded fuel and was fitted with catalytic converters. The big change for 1976 came in the form of front disc brakes with the option of power assistance, and larger rear drum brakes. The power steering was also made quicker with 3.8 turns lock to lock and the suspension received a front anti-sway bar.. The Ranger option package was also introduced. For 1977 the body had some subtle re-styling with the replacement of the fuel fillers with ones concealed behind flaps. 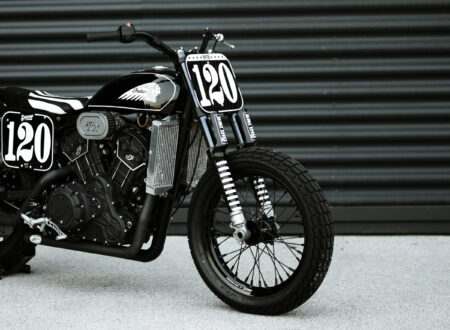 The fuel tank was enlarged to 14.4 US gallons with the option of an 8 US gallon reserve tank, both tanks now being made of plastic, whilst the front handbrake cable system was re-designed. 1977 was the last year of production of the first generation Ford Bronco. The car was to develop further into becoming a full SUV more like the Chevrolet Blazer in the following generations, but the original first generation which really sits, like the International Harvester Scout, in the twilight zone between being a rugged utilitarian car and a more luxurious SUV that lends itself to easy restoration, and to creative re-modeling. The Ford Bronco is not a complex vehicle to examine and evaluate and the usual cautions apply. 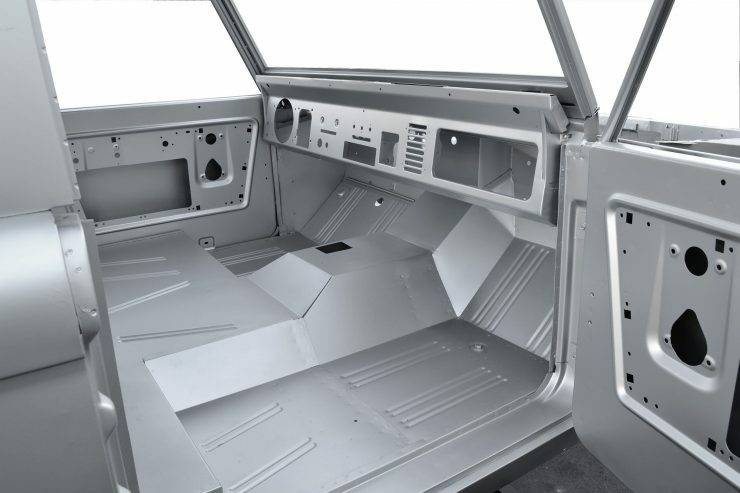 Rust in body or chassis are what you are searching for and seeking to evaluate whether the body is in sufficiently sound condition to warrant the price being asked. Generally you are better off spending more on a car that is in good condition than buying a rust bucket hoping to fix it yourself. Use a small ice pick to tap chassis sections listening for a metallic ping, which is good news, and not a flat sound, which indicates rust underneath. Chassis and body panels typically rust from the inside out. Also remember that paint and plastic body filler are often used to cover up rust or accident damage so have a magnet and check any suspect areas. Normal areas to especially examine are where suspension is mounted to the chassis and the inside of body panels, especially areas that would accumulate mud, water or salt. When buying a 4WD remember it may well have been used for beach running or fishing and may not have had the salt thoroughly hosed off the underside afterwards. Salt plus water equals rust on steroids. The rocker panels are a known problem area for rust in Broncos and that rust can carry through into the floor pans. Inner door frames must be checked especially at the hinges and the cargo bed floor on pick-ups, especially where it meets the passenger compartment. The firewall is another area to check thoroughly as are the inner fenders. The Ford Bronco was built on Ford generic parts and is pretty agricultural to repair and examine. For the engine you are looking at a compression test or cylinder leakage test, listen for rattles and knocks when its running, check for oil leaks including checking the radiator coolant for milky deposits which indicate oil leaking into the coolant. For the transmission and running gear you need to take the car for a decent drive and evaluate it for steering wander or failure to return to center, that the gears change well and do not jump out on the over-run, that there are no grumbles and grinds from the transmission etc. nor knocks from the drive shafts. Drive it on a loose surface in four wheel drive as well as in two wheel drive on the road. A basic six cylinder Ford Bronco is at the baseline as far as price is concerned whilst those of late production with the 302 cu. in. V8 are of more value. The big ticket item though is the physical quality of the condition of the car. The special models, especially the rare Stroppe Baja Bronco of which only 650 were made, are of higher value, but beware of fakes. Checking on a high value Bronco such as that is best done by a marque expert who can evaluate chassis and engine numbers and the special equipment fitted. It isn’t difficult to create a fake “rare” model and pass it off as genuine. The Ford Bronco has always been the sort of car that an owner would buy and modify. 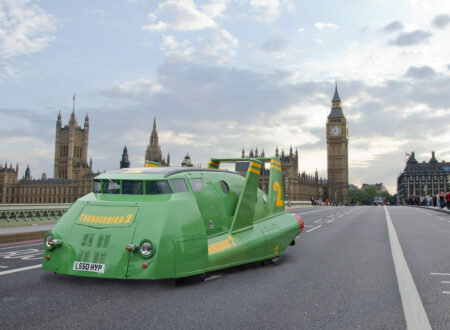 If you are looking for a car to modify and use then you are probably better off looking for one that someone has already modified in the way you are intending. Modified cars are usually less expensive than pristine examples in original condition. The first generation Ford Bronco are a very desirable automobile, and this is being discovered by collectors and ordinary people looking for a reliable and inexpensive to repair and customize four wheel drive. The Ford Bronco was and still is a great on-road/off-road car and once properly restored and configured should pretty much last for as long as the owner’s lifetime and beyond. So if you are planning on buying one look at lots of cars and be patient until you find one that is the genuine article and in excellent shape. Photo Credits: Ford Motor Company, Mecum Auctions, Bonhams, Icon.